We are pleased to announce the 8th annual El Haddawi Winterschool. 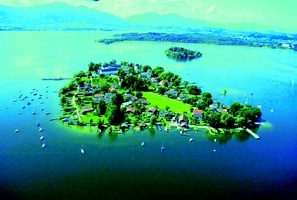 It will take place from December 27th 2007 to January 1st 2008 at the island convent "Abtei Frauenwörth" on the Chiemsee lake in Bavaria, Germany. El Haddawi invites you to experience a confluence of bodywork, dance and martial arts as an expression of practical spirituality and a way to approach healing through the heart. Throughout our lives we carry a deep longing inside each of us. In moments of love, we feel ourselves close to the aim of our longing. Uncountable songs, poems and stories have love as the theme. Love enables human beings to cope with big sacrifices, to die and to give life. The essence of love withdraws itself from our rational understanding and remains a deep mystery. What is the connection of all this with our body, with dance, music or even Martial Arts? Through exercises from different spiritual traditions and bodywork systems, we will use our bodies as gates to experience opening our inner spaces. Music, Dance, Movement Improvisation, as well as elements from the Martial Arts, will open new levels of practical experience for body, spirit and soul. In addition to seminars taught by Ingo Taleb-Rashid and Thomas Farnbacher, there will be classes and lecture-demonstrations taught by invited lecturers. There will also be an opening ceremony, performance and Sacred music concert. Accommodation and meals will be provided on site. The fee for tuition will be the equivalent to € 440 including all classes, lectures and special events. Fees for accommodation, meals and transportation are separate. Early registration (until 6th of Nov. 2006) and payment of the Non-refundable deposit of € 200 will reduce tuition to € 380.